Poor Tom Cruise. Not only is Andrew Morton bringing out a typically gossipy and mud-raking biography, but a video appears online in which he makes a less than convincing case for the merits of Scientology. One German historian said that listening to Cruise speak reminded him of Joseph Goebbels. All this after the German authorities tried to disrupt his filming in the country because of official concern that Scientology's "totalitarian structure and methods may pose a risk to Germany's democratic society". I am not a Scientologist, nor are most of the people Tom and I work with, but that doesn't mean I can sit by silently while he is attacked for his religious beliefs. As a filmmaker and an American, I feel strongly that an individual's religion should have no bearing on their professional life. I have always believed that Americans celebrated these differences, and to see the vitriol that has been directed towards my friend is truly discouraging. I must say I think Ms Wagner has a point. Tom Cruise seems like a pretty decent guy. He is, by all accounts, a devoted husband and father. He has brought pleasure to millions. Like most Hollywood stars, he as made a few good films, and a rather greater number of awful ones. But he has never forced anybody to watch his performances. He has never hurt anyone. His only crime is to be associated with a non-mainstream religion. Admittedly Scientology isn't everyone's religion of choice. Its founder, L. Ron Hubbard, was a fairly obvious con-man, its fund-raising methods are dubious in the extreme, its theology is a mish-mash of sci-fi and Fifties psychobabble. But are its beliefs really stranger than those of, say, Catholicism, which requires its adherents to believe in transubstantiation and papal infallibility? Has anyone ever been murdered for criticising Hubbard? How many Scientologists have tried to dictate morality, or threatened non-Scientologists with Hell? All religions are palpable nonsense to those who do not adhere to them. Except that where the "great religions" are concerned most people are too polite to say, or even think, so. Scientology, however, is a soft target. Because it's of relatively recent origin, it has yet to build up the patina of ancient wisdom that protects other, equally preposterous, belief-systems. Embarrassing details about its creator can't be expunged from history, or written off as the deluded ramblings of heretics and persecutors. And so it remains perfectly acceptable to ridicule the deeply-held faith of Tom Cruise, whereas the equally risible beliefs of Mike Huckabee or Tony Blair have to be accorded respect. So it becomes open season on the Hubbardites. It's almost as though there's a pent-up desire to laugh at other people's religions, that, short of socially-acceptable outlets, bursts upon Scientology like the Atlantic bursting through the Pillars of Hercules. No bad thing, perhaps, in an absolute sense. Scientology deserves to be laughed at. 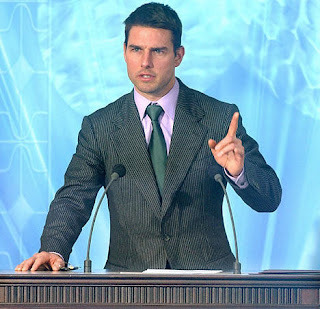 Tom Cruise, on the other hand, is a sincere believer. And, like other sincere believers in religious fairy tales, his delusional beliefs don't make him a bad person, and may even help to make him a better one. Nah, u are well missing the point, mate. You can hardly compare passing the collection plate around at a sunday service with the deeply exploitative practices of Scientology. >"Catholicism, which requires its adherents to believe in transubstantiation and papal infallibility?" Ditto for Papal infallibility. In 2,000 years there has never once been a fallible Papal statement in regards to the Catholic faith. Of course, there have only been two.